1. For the sauce, mix all of the ingredients together and set aside. 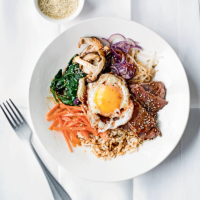 To prepare the bibimbap, bring a large saucepan of water to the boil. Blanch the carrots for 1 minute. Remove with a slotted spoon, drain and transfer to a bowl. Bring the water back to the boil. Blanch the beansprouts for 2½ minutes, drain and transfer to a separate bowl. Season each with a quarter teaspoon of sesame oil and soy sauce. Keep warm. 2. Warm ½ teaspoon of sunflower oil in a frying pan or wok over a high heat. Stir-fry the mushrooms for 4-5 minutes until softened. Remove. Add another ½ teaspoon of sunflower oil and fry the onion. Transfer to another bowl. Stir-fry the spinach in the dry pan for a few minutes, until wilted. Season each vegetable with a ¼ teaspoon of sesame oil and soy. Keep warm. 3. Return the pan to the heat, add the remaining sunflower oil and beef. Stir-fry for 1 minute, add 1 teaspoon of soy sauce and sesame oil and fry until thoroughly cooked. Warm a clean non-stick frying pan with the remaining oil and fry the eggs to your liking. 4. Heat the rice according to pack instructions. Serve in 4 individual wide bowls, place a fried egg in the centre of each one, then arrange the vegetables, rice and meat in individual piles around the egg. Sprinkle over some sesame seeds and serve immediately with the chilli sauce. To eat, add 2 teaspoons of the sauce and mix everything together thoroughly, then add more to taste. 5.5mg iron per serving. 2 of your 5 a day.